Have you ever failed to realize that an old ring, an old lab vessel, or a bit of white metal scrap was made of platinum? If you have, you are not alone. 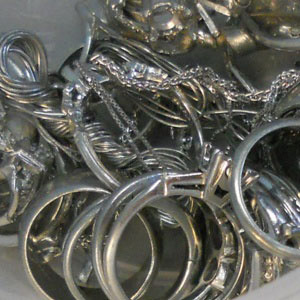 Because platinum is a white metal, it is easy to mistake it for silver or even something as low-end as polished pewter, stainless steel or even aluminum. Can you tell the difference between platinum, silver, aluminum, stainless steel, or pewter just by looking? Here are three facts that can help you recognize platinum more quickly and reliably. It is easy to overlook this fact, because most of the platinum you find in your hunting for precious metals tends to come in small pieces –little rings, broken-off pins that held gemstones in place, or lathe cuttings. Yet the fact is, platinum is heavier than either gold or silver. It is about 60% heavier than gold, which is a pretty heavy metal too. And gold, depending on its karat rating (and what other metals are mixed with it) is about 30% heavier than silver. So a small portable jeweler’s scale can help you recognize platinum. Or if you are looking at an item like a piece of lab equipment or a larger ring, simply pick it up and assess its heft. It if feels too heavy to be silver, it could be platinum. Remember, the weight of platinum is generally more than that of any other white metal. Yes, platinum is a very stable metal. It doesn’t oxidize or “tarnish” in the traditional sense, meaning that it will not combine with oxygen. Yet when it is exposed to high heat (as is generally the case with laboratory vessels and other equipment), it does discolor, taking on a bluish or even greenish tint. So if you come across a discolored item that is made of white metal, don’t immediately assume that it cannot be made of platinum. You could be looking at something quite valuable. Another common misconception about platinum is that it is hard and will not scratch. The fact is, platinum is soft and will scratch very easily. (Lots of people who own platinum wedding and engagement rings make that unpleasant discovery.) If you find a piece of white metal that shows scratches, abrasions and other surface wear, don’t immediately assume that it must be silver, pewter or another soft white metal. Chances are good that you could be looking at platinum. Call Specialty Metals Smelters and Refiners at 800-426-2344. We will be happy to discuss your discoveries and test them to assess their value. When you call, you will be surprised to learn how inexpensive it is to send items to us for testing. In many cases, we offer discounted or free shipping, so be sure to ask.